The three-star running back chose A&T despite having several FBS offers. East Carolina football’s loss is once again North Carolina A&T’s gain. Burlington (NC) Williams’ Shemar Thompson announced his commitment to A&T on Sunday, February 3rd. The three-star running back de-commited from ECU back in December. The 6’0, 190 lb running back also had offers from Coastal Carolina and Gardner-Webb. A&T will have a big hole to fill at running back with Marquell Cartwright’s career now over. However, there are several backs who will be vying to be the two-time MEAC rushing champ’s main replacement. 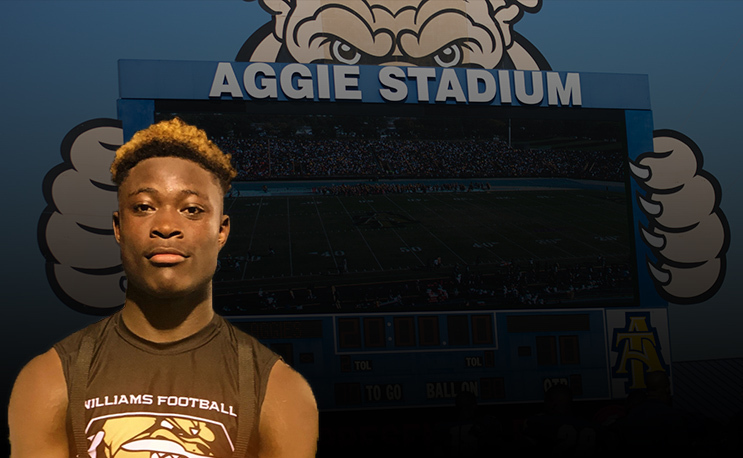 Returning to A&T will be breakout running back Jah-Maine Martin, who will be filling the shoes of Marquell Cartwright. Martin is no stranger to the field, gaining 656 yards and 7 TDs with 98 carries in his first year at A&T. Also returning will be UNC transfer, Darius Graves, who got a couple of handoffs during the season. Kashon Baker will also be returning. Baker got in on the action during the Gardner-Webb and Aggie Eagle classic game, scoring a touchdown in each. A&T has a nice streak going against ECU. It knocked off the FBS team back in September, then picked up former ECU quarterback Kingsley Ifedi just before Christmas. Now it has Thompson, who de-committed after ECU let Scottie Montgomery go as head coach. That loss to A&T probably helped Montgomery get unseated in Greenville, so you can say the win keeps yielding results.